Bedding is essential for keeping your hamster comfortable and his cage clean. Bedding a hamster cage requires more than just tossing any soft material in his cage -- even some bedding sold for hamster use is unsuitable. Provide the right amount of bedding, and avoid materials unsafe for your pet. Appropriate nesting material keeps your hamster's burrowing chamber warm and absorbs waste and odors. Individual bedding materials have pros and cons. Cedar and pine bedding, popular at one point for cost-effectiveness, have chemicals that cause upper respiratory problems and allergies in hamsters. Use aspen bedding if you prefer wood shavings. Other types of safe bedding material include wood pulp/paper, wood pellets and hemp bedding. Wood pulp has the most benefits. It's dust-free, made from recycled materials, soft and absorbent; and it helps control odors. Cover the bottom of your hamster's cage or tank with enough bedding material so your hamster can build up piles of it without leaving empty spots on the floor of the cage. It's not enough to simply cover the cage or tank bottom. Bedding is meant to provide comfort for the animal and should not be used sparingly. 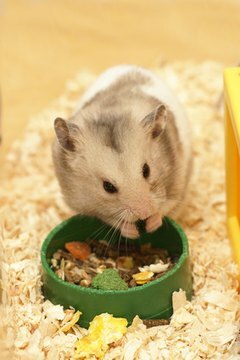 A depth of 2 to 3 inches will allow your hamster to burrow and allow plenty of excess after your daily cleaning removal. Add torn tissues or paper towels for nesting material or even hay. Hay is a good option because it's something the hamster can eat as well as stuff his burrow with. You can also use newspaper, but only that printed with a soy-based ink. The more natural the nesting material the better. Never use ground corncobs, cedar shavings or pine shavings as hamster bedding material -- even though you'll find them marketed for rodent use at pet retail. Corncob molds easily, is dusty and can cause impaction if eaten. It can also be uncomfortable for your hamster to walk on. Bedding floss, meanwhile, may look comfortable and cozy, but it can be deadly for your hamster. The floss can cause impaction and may also choke your hamster. Impaction can be deadly if not remedied by a veterinarian immediately. Signs of impaction include bloating, abdominal pain, constipation and discoloration of the abdomen.